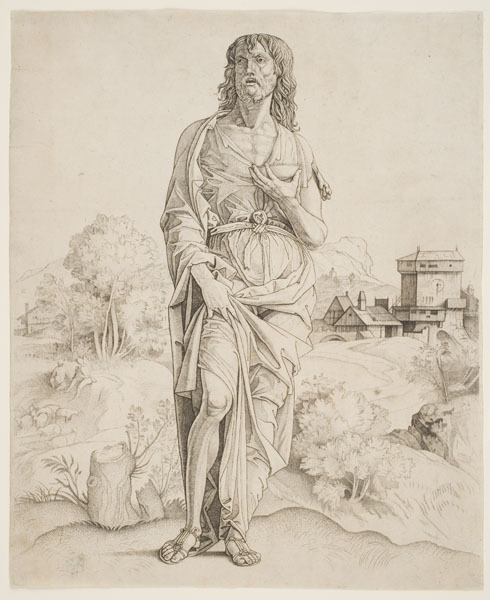 John the Baptist was a forerunner of Christ, considered by theologians as the last of the Old Testament prophets and the first saint of the New Testament. A contemporary of Christ's, he preached the coming of the Messiah. Here he is identified by the baptismal cup that he holds. This print, made in northern Italy, is remarkable for the physically palpable form and dimension of the figure, combined with an evocation of atmosphere. To imitate the misty effects of light, the artist stippled the copper plate with his graver, rather than incising lines. A versatile gentleman scholar of the Renaissance, Campagnola was a painter, engraver, poet, musician, scholar, and typographer. Born the son of a writer in Padua, he worked at the ducal court at Ferrara, and by 1509 he was in Venice. There he fell under the influence of the painter Giorgione, whose evocative, atmospheric painting style inspired Campagnola to make his most revolutionary prints.